Safari may be the best mobile browser for iOS devices, however it is missing several features that you would expect a modern web browser to have. One of those features is the ability to let users upload files on different websites right from their iPhone or iPad. A new Cydia tweak designed for iOS 8 called Safari Uploader 8 changes that by adding this all important feature, making it possible for you to upload files on any website directly from Safari. The best thing about Safari Uploader 8 is that you don’t have to leave Safari or the webpage you are currently using as you can upload files from with in. After installing the tweak whenever you tap on an upload button or link, you will be presented with three options. The ‘Take Photo or Video’ option will let you take a new photo and upload it. Similarly Photo Library option will allow you to access your iPhone’s library and let you choose the photo or video from there. Choose File option will allow you to select file from other sources. After selecting the file you can simply hit the upload button on the website to begin the process. 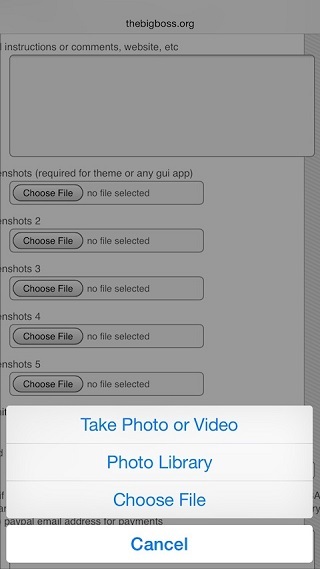 According to tweak’s description you can upload any type of file you want using this hack. Safari Uploader 8 is available in Cydia for free. It is compatible with all versions of iOS 8.